1930s child actors: threat or menace? 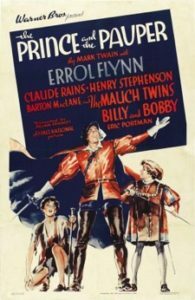 Warner Brothers had the cloying Mauch twins, Bobby and Billy, under contract, and bought the rights to Mark Twain’s 1881 novel, The Prince and the Pauper, as a vehicle for them—and after his success in The Charge of the Light Brigade (1936), added in their new action hero, Errol Flynn, for good measure. Flynn plays Miles Hendon, the down-at-his-heels gentleman who takes in the prince (Bobby, or maybe Billy) after he’s been switched with the pauper (Billy, or maybe Bobby). The film actually follows the novel’s plot pretty closely, which means Flynn doesn’t come onstage for nearly an hour, a considerable wait. Fortunately, not all of that hour is wasted on the twins, as much of the time is well spent with Claude Rains, well-cast as the suave villain of the piece, the Earl of Hertford. The presence of Flynn and Rains notwithstanding, this movie is mainly a kids’ fable, broadly played, but we can still enjoy the fine Tudor-period costumes, Flynn’s indelible charm and charisma, and the occasional razor-sharp line retained from Twain’s novel. The ending is quite absurd—but it’s a fable, isn’t it? Plus, we get one of Erich Wolfgang Korngold’s best film scores, the main theme of which was so good he reused it as the final movement of his violin concerto. Watch for Fritz Leiber, Sr., as the saintly friar, and enjoy Flynn finally getting to swashbuckle in the last twenty minutes. Guilty pleasure: the execrable Alan Hale, Sr., not yet promoted to the role of Flynn’s Permanent Sidekick, plays a minor villain who comes to a well-deserved bad end.